I know it’s a bit after the fact, but I wanted to share these Halloween photos anyways. Josiah’s original idea of being Everybody (attaching mirrors to black clothes) didn’t work out like we’d hoped, but it was still a great idea and I wish we could have pulled that off. 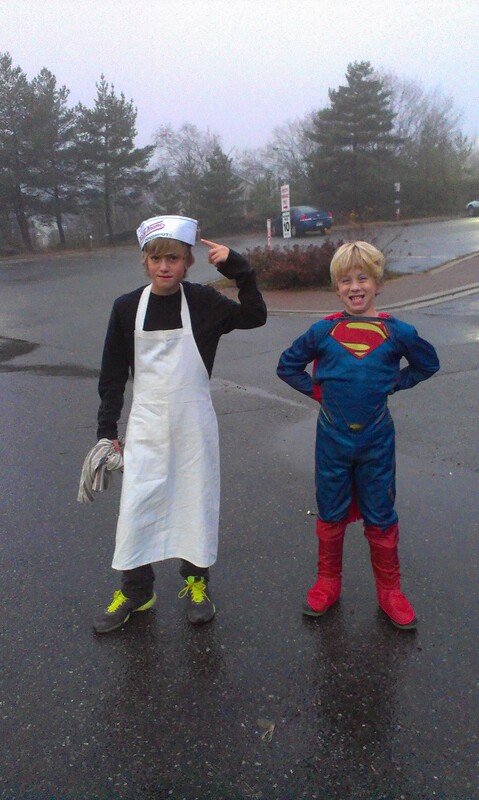 Instead we scrounged around the house and came up with a Krispy Kreme doughnut hat and a white apron. Elijah really wanted to be a Marvel Heroes something, and Superman was the favourite of all the choices available in his size 2 days before Halloween. 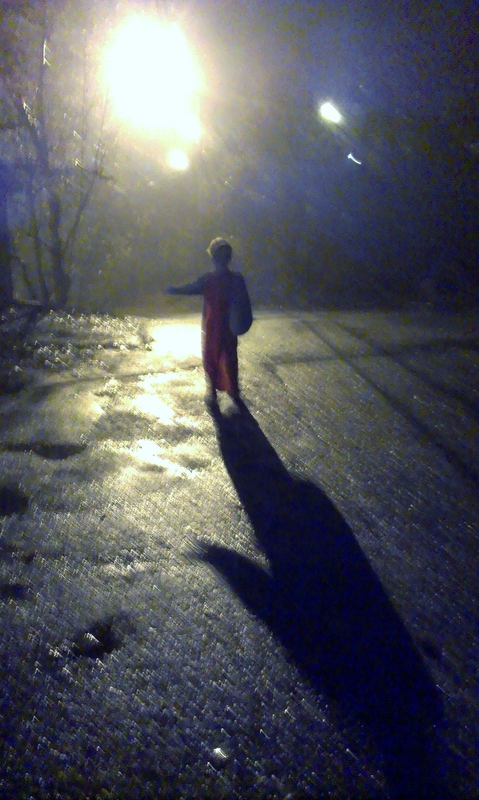 I loved the red cape – he had a lot of fun with that. 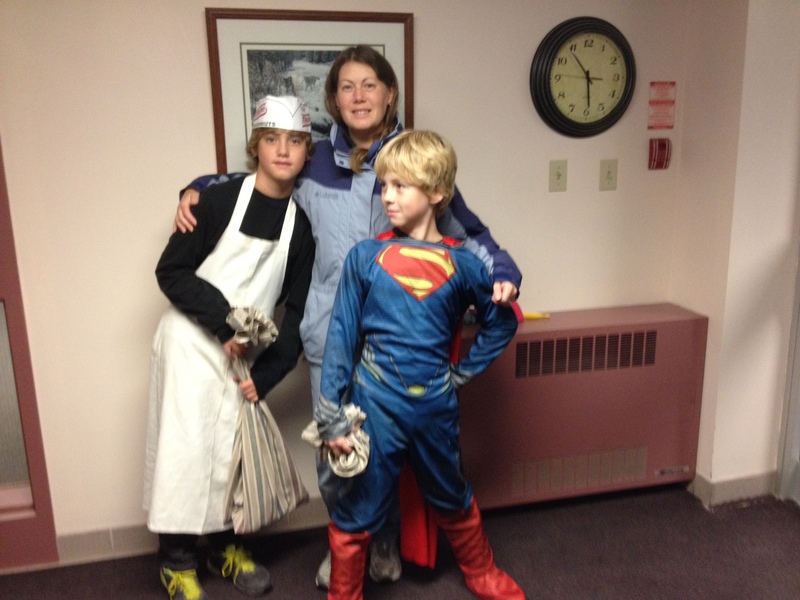 Me and the boys ventured out on Halloween night and made our traditional stop at Brenda’s place. Brenda is a very good friend of Team Sklar. We adopted her into our extended family about 10 years ago, right after we moved to Northern Ontario. We just love this woman! 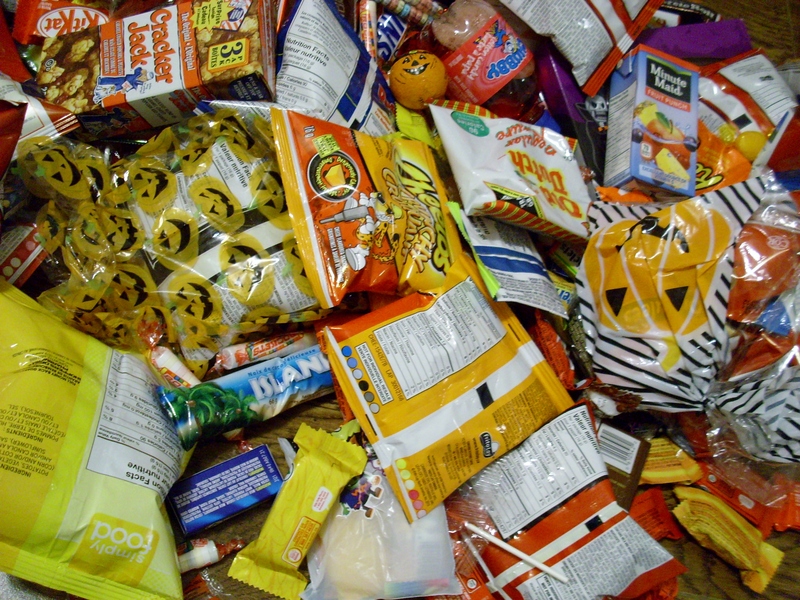 Every Halloween we visit Brenda’s apartment building and get our first stash of candy. 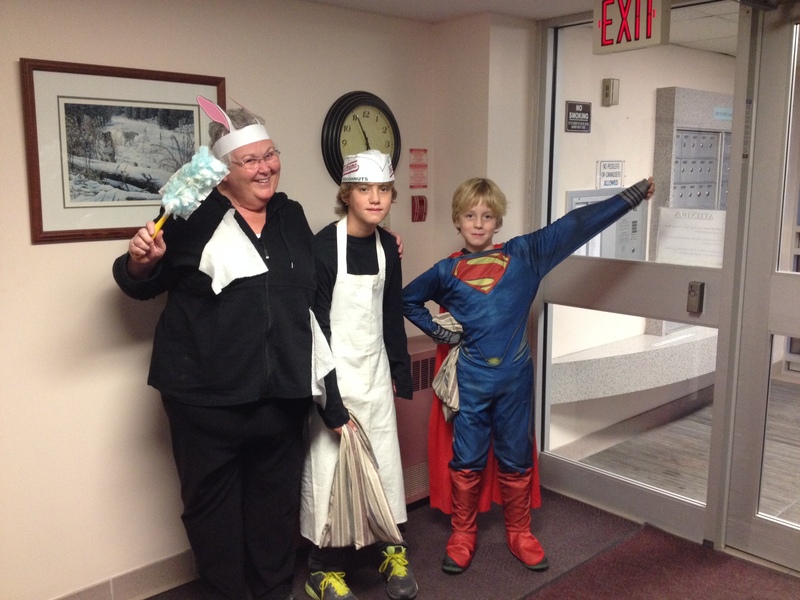 We walked into the apartment lobby and we were greeted by a familiar woman in bunny ears, carrying a duster. Awesome effort Brenda! She gave me a few chuckles that night. With our first few tastes of candy stashed in our pillowcases, we headed off to the church. 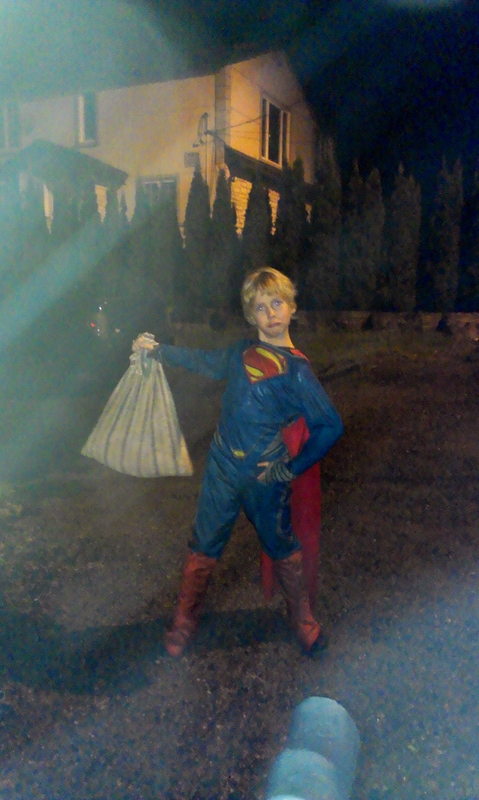 I hadn’t realized before… that there would be no more trick-or-treating with Josiah. He will be participating in the youth group activities on Halloween night from now on. 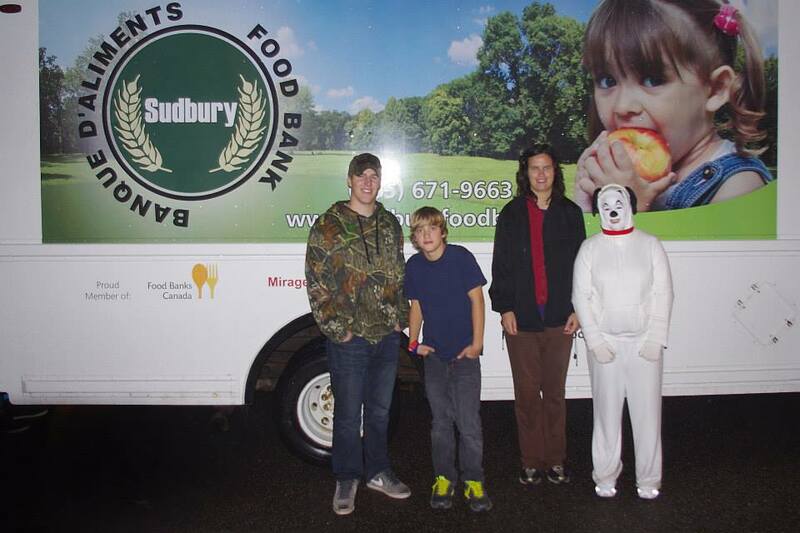 They go door to door and ask for food bank donations – a tradition my Joshua started WAY back when he was a youth pastor. The tradition came with us to Sudbury. Slight sob for the ending of another chapter in my book of motherhood, and then we dropped Josiah off at the church. Elijah and I decided to make our way back to our neighbourhood and do something we’ve never done before – trick or treat in our own backyard! Usually we go out with a couple of families and collect food bank donations as well (along with a good harvest of candy), but this year that just wasn’t in the cards. The slight drizzle couldn’t slow down Superman that night. He was faster than a speeding bullet and I could hardly keep up as he knocked on door after door and filled his pillowcase with goodies. I had so much fun just watching my youngest son enjoy this night. 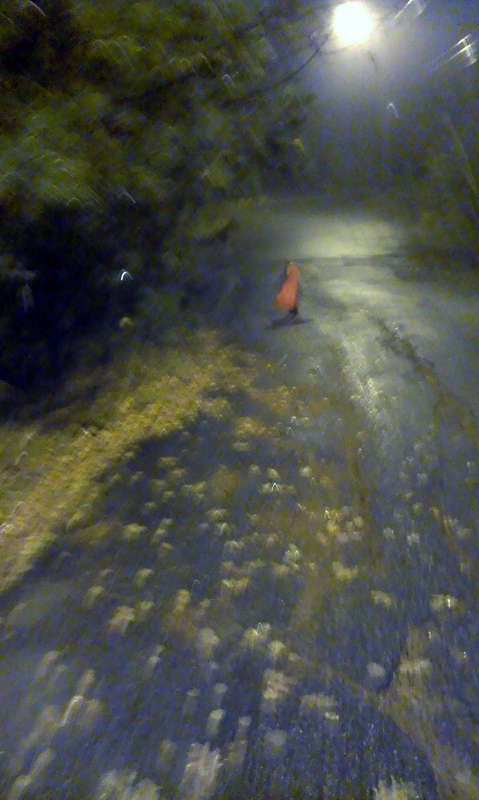 At one point he slowed right down and walked with me for a time. I asked him if he was ready to go home. Walking with me in the moonlight. Thank You God, I really needed this night with my Superman. I needed to see him living in the moments and know that life can still slow down enough to do that, and there are many more special times coming with these young men You’ve given me to raise. We pass the creek and trick or treat at about 20 more houses. Superman is still full of energy and enthusiasm for this night. We see many neighbours that we know, and it gives me a feeling of belonging to recognize so many faces as we knock on doors and wander the streets. I loved the sense of community that night. 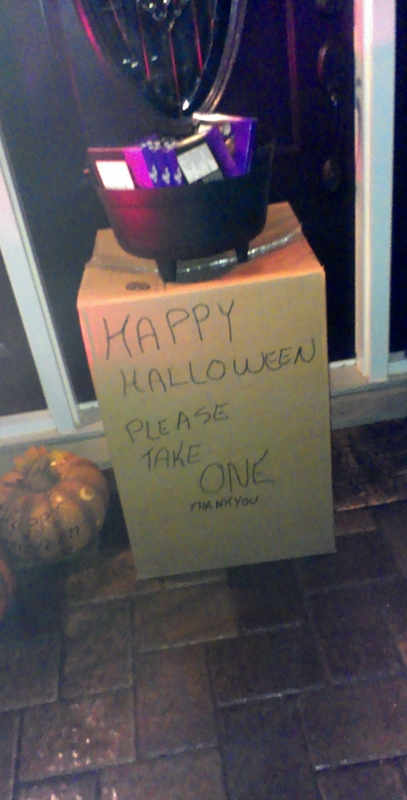 We see this pleasant surprise outside a house… “Happy Halloween – Please Take One” with a bowl full of packages of Halloween chocolates. This house was for sale, and the owners were out for the night. After the last round of houses at the creek, it is time to head home. The pillowcase is full of goodies and we pour them out to sort once we walk into our living room. Elijah calls daddy to tell him about the night. Josiah comes home a little while later after a successful night of collecting food donations for the food bank. Great news – Our church won the trophy for most pounds collected per person! It was a great night for all of us, in different ways.